Cowpeas salad – An easy and healthy vegan salad with cowpeas, potatoes and other veggies. 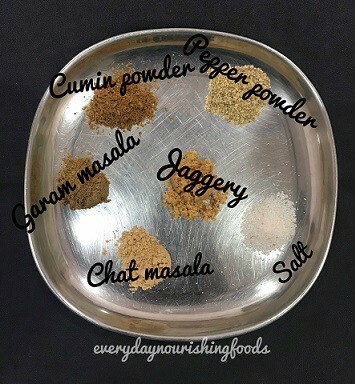 This salad is mildly spiced with Indian spices. Cowpeas or black-eyed peas or lobia is a type of legume which can grow in harsh climatic conditions and yet nutritional powerhouses. All beans and legumes will provide nitrogen to the soil in which they grow. Hence it is sustainable to the environment as well to grown different types of beans and legumes. Lobia is a rich source of fiber which will ease stomach conditions. They are rich in B vitamins, Iron, Magnesium, Potassium. Like other legumes, the outer layer will have phytic acid which will act as anti-nutrient. To reduce the effect of phytates, we need to soak them for at least 8 hours. Soaking and sprouting of grains and legumes will make the nutrients more bioavailable. You can read more about phytic acid content in millets here. These are high in proteins and vegetarians should include all types of beans and legumes for getting adequate protein in their diets. If you feel bloated after eating any type of legume or beans, then you should definitely soak them so that your digestive system can handle it. 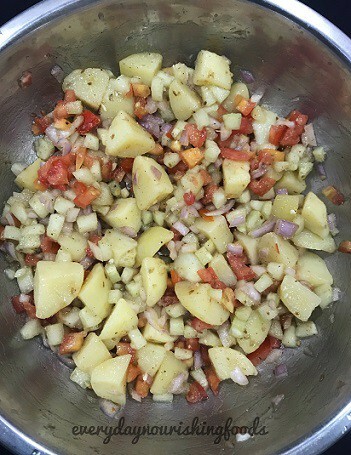 In this cowpeas potato salad, I am using cowpeas and potatoes as main ingredients. Potatoes have good carbohydrates and when combined with lobia, will become a complete meal. We usually have this salad for dinner, but this can be good for any meal. You can read about potatoes and mashed potato recipe here. Please check this link for other salad recipes on this blog. An easy and simple bean salad recipe with lobia, potatoes, veggies and Indian spices. Soak 1 cup cowpeas or lobia in 3 cups water for 8 hours. Drain water from soaked cowpeas and wash them well for a couple of times. Pressure cook these by adding 2 cups of water for 4 whistles. It will take around 15 minutes. While cowpeas are getting cooked, chop potatoes into cubes and steam them or boil them with enough water. Finely chop onion, tomatoes, cucumber, coriander leaves and keep it aside. 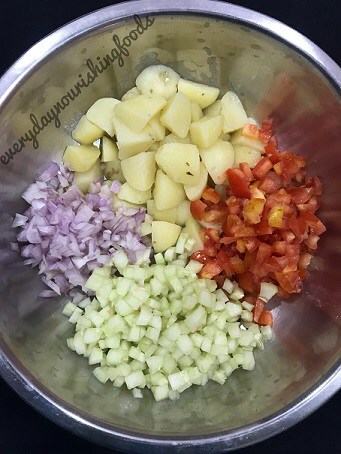 Take boiled potatoes and add finely chopped veggies and mix everything. Add all mentioned spices, lemon juice and olive oil to the above mixture and mix everything well. 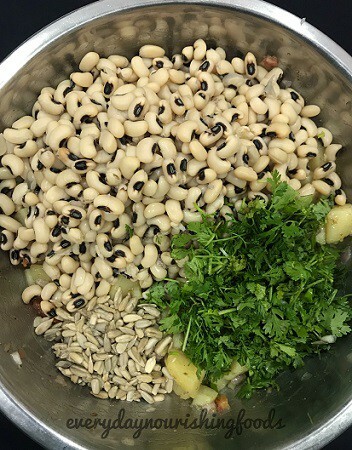 Add cooked cowpeas, coriander leaves and sunflower seeds and give it a final mix. The salad is ready to serve !! Salad can be served cold or hot. Make sure to add salt and sunflower seeds just before serving.